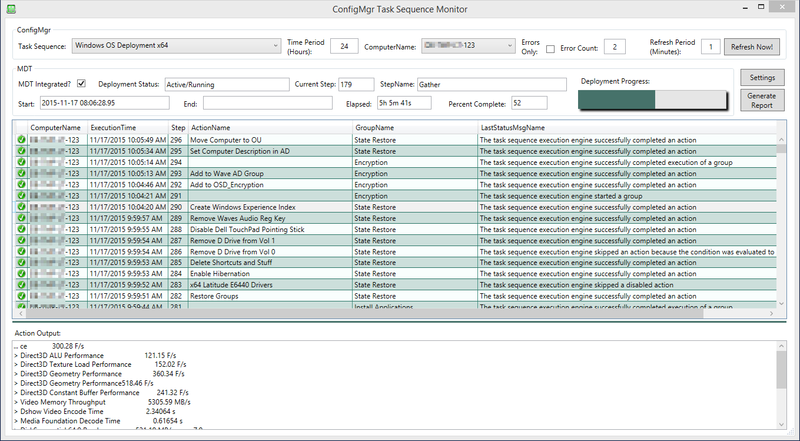 It is a tool for monitoring or reviewing task sequence executions in Configuration Manager and is particularly useful for monitoring Operating System deployments. Where integration with MDT is available and the MDT monitoring web service has been enabled, the app can include the data from MDT for an enhanced monitoring experience of your ZTI OS deployments. Action output can be displayed for each step of the task sequence, giving more detail about the execution of that step, and is useful for quickly identifying the cause of any errors in the task sequence execution. The app can also generate an HTML deployment summary report for any task sequence. The tool is my first publicly released WPF application coded entirely in PowerShell, so I welcome any feedback! I can’t get this to run on Windows 7 Enterprise or Windows 10 enterprise. I see a brief window flash but then nothing loads. I have all the pre-reqs. Thoughts? I’ve now got it working, except the summary report. Where can I find the report? Hehe my bad my edge browser fell asleep, gave a hero reboot. I’m not able to modify the error count number. I’m able to modify the refresh period. Thoughts? Windows 10 enterprise. The error count is a read-only field that displays the count of steps in an error state in the data grid. I am wondering what permissions a user needs in order to be able to see the Task Sequences? Our engineers can see the task sequences in the list, however I am unable to see them while I am logged in. Hi Jon, db_datareader permissions only are required to the ConfigMgr database. Hi Trevor, I am getting ERROR Could not connect to SQL Server database. I am running it as the SQL Admin from my Windows 10. I first install it as local admin, bu then I tried to run it as different user (Using my SCCM MDT Admin account), didnt work. Try running the following POSH code as the same user on the same machine. It should give you the actual error returned by the SQL server. I’m currently planning a similar project for my workplace. Any chance of having a sneak peak at the powershell behind this? Works great but if you are running Cylance for your anti-virus it blocks it because it is writing to the app data temp directory. Give it the ability to write those files back into its own directory then Cylance will not detect it and it will work. Because it is powershell scripts and writes to temp directory. The hash is always changing so that is why it gets block. Great tool! I couldn’t find the report for ages but then I remembered I was running the app as an admin so was looking in the wrong temp file!! !